Epoxy flooring is a staple inside manufacturer facilities due to its durability, resistance, and shine. Though it is usually associated with a warehouse environment, epoxy flooring can be installed in your home’s high-traffic areas, adding that same amount of durability to your floors. If you’ve thought about replacing your concrete garage floor, epoxy flooring might be the right option for you. Read on to check out the benefits of switching your old flooring to epoxy. Epoxy floors are created by applying multiple coats of a resin-like material that must cure and harden. The curing process between layers adds thickness that creates the durability of the material. The finished product should be smooth and seamless, and it will be able to withstand the typical wear and tear that occurs on a garage floor. By adding epoxy flooring to an existing concrete floor as a layer of protection, you can easily extend the life of the floor for years. Along with the necessary thickness to prevent damage, once cured, epoxy floors are no longer porous. This allows the flooring to be resistant to stains that can usually occur when oil, chemicals or water spills collects onto normal flooring. If you live in an area that experiences heavy snowfall, epoxy flooring is more resistant than concrete to the buildup of water, snow and road salt that your car can bring into the garage. Overall, this characteristic of epoxy allows for easier cleaning and the ability to keep the flooring well-maintained by a homeowner. When choosing epoxy flooring, you have the ability to select materials that offer anti-slip properties. Anti-slip varieties have gritty material like quartz sand mixed into the final layer to allow better grip, decreasing slips and falls. Even if a floor is not anti-slip, the glossy shine of the floor contributes its own safety benefit. The reflective finish can increase visibility inside a dimly lit garage. Epoxy flooring not only adds a showroom shine to your garage floor, but it can come in a variety of colors and styles. Floors can range in color from pale shades of cream or gray to darker shades of maroon or black. Along with choosing different hues, some styles of epoxy flooring add a splash of color or marbling effect by having colored paint chips mixed into the layers. 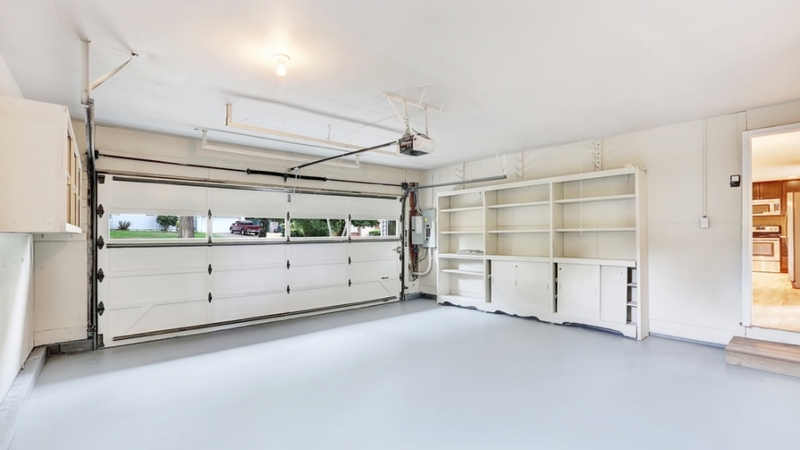 When installed correctly, epoxy flooring can last decades and give your personal garage a professional look.